When you think about how much to charge for a night in your vacation rental, you don’t just pull a random number out of thin air. Instead, you take a lot of factors into account. Unfortunately, there’s only so much you can do about things like size, location, and whether someone set up a noisy construction project next door. But there is one thing of which you have 100% control — and that is the cleanliness of your home. To be sure, cleanliness requires effort and money. Even if you choose not to hire a professional cleaning service, you still have to ensure guests won’t complain about dust mites or funny smells from the bathroom. In any case, cleanliness is a good investment. Not only is cleanliness next to godliness, but having a spick-and-span place can work wonders for your bottom line. In fact, you can boost your vacation rental income by as much as 20% just from keeping your space nice and tidy! If that sounds too good to be true, consider the following 5 benefits of cleaning your vacation rental. 1. Cleanliness makes a good impression on guests. Also, cleanliness has a positive psychological effect on guests. When an asthmatic stays in a dust-free room, for example, it may feel like heaven to them. And if an Indiana University study is to be believed, in general, people feel better when they stay in a well-kept room. Even if your rental has the best amenities or has a prime location, your guests won’t review it positively if they’re uncomfortable throughout their stay. On the other hand, if your place is as clean as the day you bought it, guests won’t mind if there’s no fancy pool or gym nearby. 2. Cleanliness leads to good reviews. In this day and age, it’s no longer enough to get a 3- or even 4-star review. You have to get 5 stars — or, at least, something above 4. Why? Because most vacation rentals rate between 4 and 5. Score any lower than that and you might as well take your rental out of the running. If guests see a dozen 4-star rentals above your 3-star listing, they’ll only look at the top 5 or 10, at most. Also, when you garner enough 4- to 5-star reviews, your place gets pushed further and further up the search results. When your listing is ranked high enough, guests are more likely to find it. And when guests are more likely to find your listing… Well, you get the picture. So, you have to work really hard to improve your vacation rental reviews. One of the best ways to do so is — you guessed it! — keeping your place so immaculate that even gods cry when they see it. 3. Cleanliness boosts your guests’ willingness to pay. All else equal, guests would rather pay more for a well-kept room than save money for an untidy one. After all, when guests pay to use someone else’s home, they expect the owner to provide a certain degree of service. A clean space is a surefire way to convince guests that they’re getting what they paid for. If you clean your vacation rental on your own, you can charge a reasonable amount in cleaning fees and pocket it. You can adjust that amount based on what other rental owners charge or what you feel is the best price based on the effort you put into cleaning. If you hire a professional to clean your place, charge the amount you paid the them. Otherwise, use your best judgment and the information available to you to set a price. At any rate, guests whose budget fits within your rental rate won’t mind the extra fee. 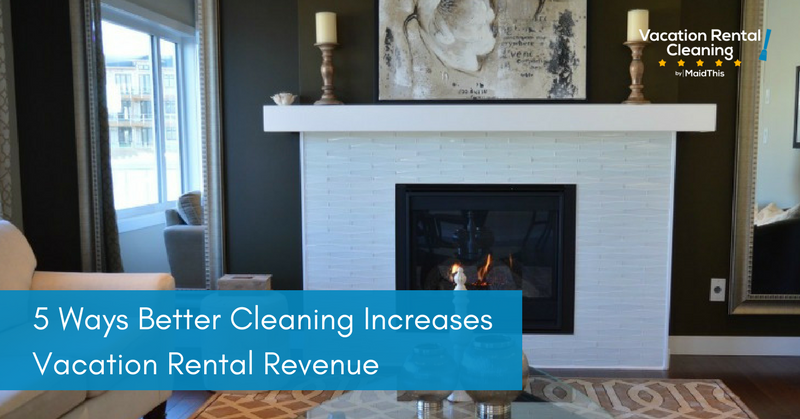 Instead of spending hours researching online about the cleanliness of a vacation rental, most people assume that a place charging a “cleaning fee” will be automatically clean. 4. Cleanliness makes it easier to post about your vacation rental online. As the old saying goes, “A picture is worth a thousand words.” If your guests see professional photos of your tidy space online, they’ll hit “book” faster than a roadrunner. But if you don’t have any images of your unit or if your photos look like they’ve been taken on a low-resolution phone, they’ll skip to the next listing without batting an eyelash. To market your vacation rental using images, clean your place from top to bottom. Hire a professional to take photos of the rooms at flattering angles, then upload those photos to your listing or Facebook page. Next thing you know, your bookings will go up, along with (positive) reviews and revenue. 5. Cleanliness makes your place valuable long after you’ve stopped using it as a vacation rental. What if, for example, you decide that your place shouldn’t be a “vacation rental” anymore? What if, for one reason or another, you decide to sell it off in the end or live there yourself permanently? Either way, you can still add value to your place, provided it’s clean. Overall, people pay more for a piece of well-maintained property. In the event you decide your vacation rental is better off with someone else (or as something else), sprucing it up can only make it more attractive. Cleaning may take more time and money than you’re willing to spend. You may even think it’s a pointless waste of time since the benefits aren’t immediately apparent. If you keep a vacation rental as clean as it can be, though, you can expect a steady stream of positive reviews to trickle in and, hopefully, a steady stream of income with it. Want to boost your vacation rental revenue today? Learn more about our turnover cleanings.